The Beginning of the End for Barnes and Noble? Maybe it's not what it seems. Maybe it's worse. When Borders was shuttered in 2011 most analysts felt that competitor Barnes and Noble would benefit. Yet, 2012 was not a good year for the last remaining brick-and-mortar mega bookseller. Store traffic has been falling, same store sales were down in the critical holiday season just ended, and B&N had a total drop of $1.2 billion in overall sales during the nine-week period ending Dec. 29. It's no secret that Barnes and Noble is challenged by the showrooming effect that we've blogged about before. Showrooming is the practice of visiting a bricks-and-mortar retailer to learn about and make a product selection and then purchasing that product at a lower price on the internet. The leading online bookseller Amazon.com, not only doesn't have the overhead of the many retail locations of Barnes and Noble, but also in most states they are not collecting sales tax. The net effect is a substantially lower price to the consumer who buys online. In addition to the tough competition in print books, consumers have been buying fewer print books as e-readers have become popular. Here too, Amazon.com's Kindle has proven to be the leader and has reported that their sales in Kindle e-books has surpassed their sales of print books. Not many years ago, Barnes and Noble and Borders so dominated the industry that local independent booksellers had been written off. Today, with Borders gone and Barnes and Noble struggling, independent booksellers are making a resurgence. The American Booksellers Association reported 43 new store openings in 2012. It's not a rosy picture for Barnes and Noble stores. Even worse, are the prospects for print books as a whole. The publishing industry would be hard-pressed to survive without the hundreds of retail outlets for its books that B&N offers. Yet, Barnes and Noble has announced a long-term plan to close a third of their locations in the coming years….even though most of them are profitable. Though I love the all too rare independent booksellers, I've already missed the Borders, and I'm sorry that we'll have fewer Barnes and Nobles. Even though I own a Kindle, I have not been able to wean myself off print books, and I don't really feel the need to. I guess I just want it all. This entry was posted in Bookstores, Business and tagged Barnes and Noble, books, bookstore, Kindle. Bookmark the permalink. 3 Responses to The Beginning of the End for Barnes and Noble? 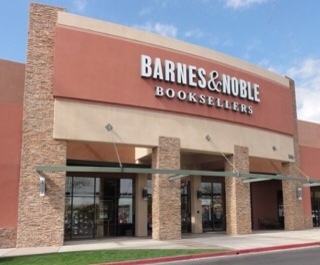 Large chain stores such as Barnes & Nobles and Borders were once the behemoths that closed so many independent bookstores, so now they’re experiencing the payback. The independent bookseller that knew your tastes and made recommendations that would match them has been replaced by an Amazon analysis that determines your taste and suggests books that match your purchase preferences. The independent store that would take a chance on less well known authors is now the online store that has no real limits on the e-books it can carry. Shopping at a chain bookstore that would only carry the top two or three books of a beloved author got old quickly. I am now much more satisfied with the plethora of used bookstores and what I discover online at Amazon and ABE books. With those and Costco for the big sellers at super-discount prices, I think I will miss the chain stores much less than I would have 7-8 years ago. Thanks for your comments, Maria. The real takeaway here is not just the bad news for Barnes and Noble. If they go under, they could very well take the book publishing industry and the indy bookstores with them. Even worse, the research shows that bookstore closures don’t result in more e-book sales. The net result is that people read fewer books. If the big chains aren’t selling books, those who read must be purchasing nooks online, either paper or e-books. I wonder why one would expect e-book sales to rise if the chains close. Although I continued to purchase books from the big chains when online sellers began, I quickly realized that I could read a synopsis of a book online and then purchase the book for less than a brick and mortar store. The convenience of having books delivered to my home after an online purchase was and still is a benefit. The first books I purchased online were those I read for fun. I continued to purchase computer books from the chains until they no longer carried the books I wanted. A year ago last May I looked and saw that the books I read for pleasure had become available for the Kindle, so I purchased a Kindle. E-books are so convenient that I’ve had a hard time picking up a paper book. Those paper books I’ve purchased are gifts and have been from online sellers because they are also not carried by the chain stores. There are a great many free e-books available via Amazon.com, and gutenberg.org. Baen.com has free science fiction books. In some cases there are html books that can be converted to e-book format and these are free as well. For me, the online book sellers for paper and certainly for e-books have become far more convenient and easier to use than the chain stores.